(P2) In some early versions of trick-or-treating, men paraded door-to-door, and boys often followed, begging for coins. Most of these early trick-or-treaters were poor and actually needed the money, but wealthy children also joined in the fun. Door-to-door “begging” was mostly stopped in the 1930s, but re-emerged later in the century to distract kids from pulling Halloween pranks. 2. Halloween is more Irish than St. Patrick’s Day. (P3) Halloween’s origins come from a Celtic festival for the dead called “Samhain.” Celts believed the ghosts of the dead roamed Earth on this holiday, so people would dress in costumes and leave “treats” out on their front doors to appease the roaming spirits. The Irish Celts were the ones who invented the jack-o’-lantern. 3. If you’d been around for the earliest Halloween celebrations, you might have worn animal skins and heads. (P4) According to ancient Roman records, tribes located in today’s Germany and France traditionally wore costumes of animal heads and skins to connect to spirits of the dead. This tradition continued into modern day celebrations of Samhain, the Celtic holiday that inspired Halloween in America. On this day, merry-makers often dressed as evil spirits simply by blackening their faces. 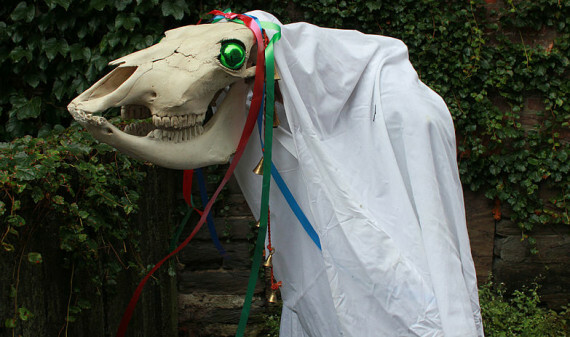 The leader of the Samhain parades wore a white sheet and carried a wooden horse head or a decorated horse skull (a modern Welsh version of this costume is shown above). Young people also celebrated by cross-dressing. 4. Jack-o’-lanterns were once made out of turnips, beets and potatoes — not pumpkins. (P5) The jack-o’-lantern comes from an old Irish tale about a man named Stingy Jack. According to folklore, Stingy Jack was out getting sloshed with the Devil when Jack convinced his drinking partner to turn himself into a coin to pay for the drinks without spending money. Jack then put the Devil, shaped like a coin, into his pocket, which also contained a silver cross that kept the Devil from transforming back. Jack promised to free the Devil as long as the Devil wouldn’t bother him for a year, and if he died, the Devil could never claim his soul. (P6) When Jack finally died, God decided he wasn’t fit for heaven, but the Devil had promised never to claim his soul for hell. So Jack was sent off to roam Earth with only a burning coal for light. He put the coal into a turnip as a lantern, and Stingy Jack became “Jack of the Lantern” or “Jack o’ Lantern.” Based on this myth, the Irish carved scary faces into turnips, beets and potatoes to scare away Stingy Jack or any other spirits of the night. Do you celebrate Halloween in your country? Is there any tradition to scare off ghosts or spirits? Have you ever dressed up on Halloween? Is superstition a big thing in your country? What were some of the earlier version of trick-or-treating like? Why is Halloween more Irish than St. Patrick’s Day? Who wore animal heads and skins? AMERICAN FOOTBALL COMING TO LONDON?